By the time you read this, I will have survived a month in the intensive care unit! And it was actually really great. There were definitely hard moments, definitely sad ones, but it was balanced by many happier moments shared between all of us on 10 East. It was a memorable month and will forever be a little extra special. When I started off residency I knew that I would be blogging a lot less. Which made me sad because I thought that would also mean I'd be baking a lot less. But this has not been the case! There has still been a steady stream of goods in the tiny asian home, from cookies to stash away in the freezer to cinnamon buns to bring to the team the next morning. Plus Andrew's team across the street at UIC, which has been a very nice convenience for the days I baked more than I can carry. Last year I was really into cakes, a for a brief stint this summer baking was all about the chocolate chip cookie. But my lately I find myself daydreaming more about bread - fluffy breads, crunchy crusts, chewy innards. 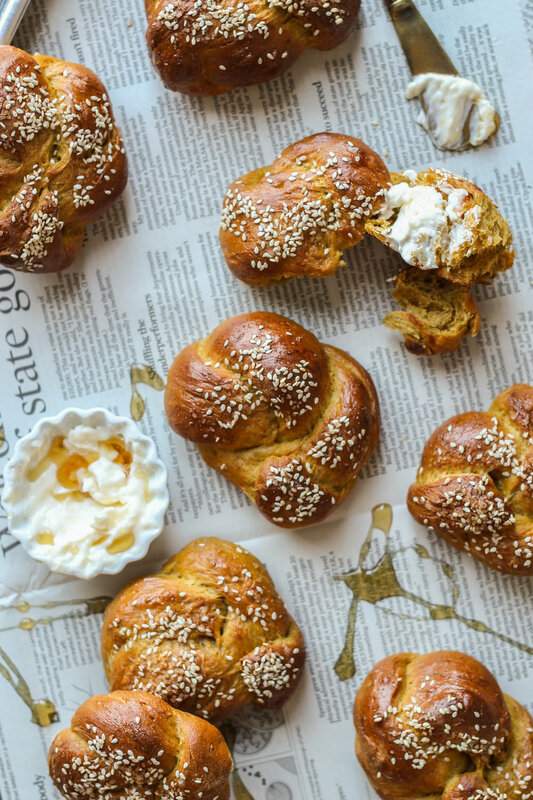 Yeast is so versatile, you can make dreamy buns slathered in cream cheese frosting or savory rolls to accompany the dinner table. And there's something incredibly satisfying when you watch your dough rise, something incredibly umami smelling that simple combination of flour, water, yeast, and salt. I got carbs on the brain and hopefully in the next few months, in my belly. I don't know if I'm yet ready for the leap to a sourdough starter or anything like that... but who knows? Maybe I'll call it Fred. 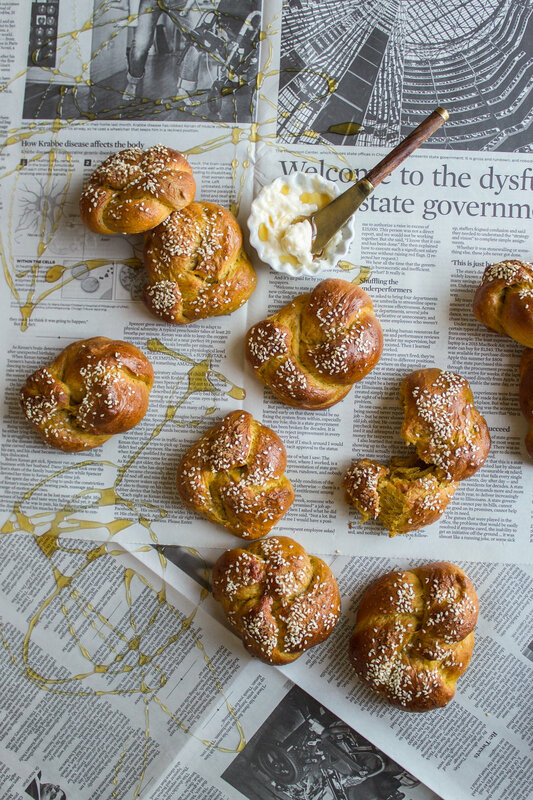 These pumpkin challah rolls are the result of my recent carb loving self. They were supposed to be a part of yesterday's #virtualpumpkinparty hosted by the sweet Sara at Cake Over Steak, but hospital life got in the way and I couldn't muster up enough brain power to write a meaningful post. 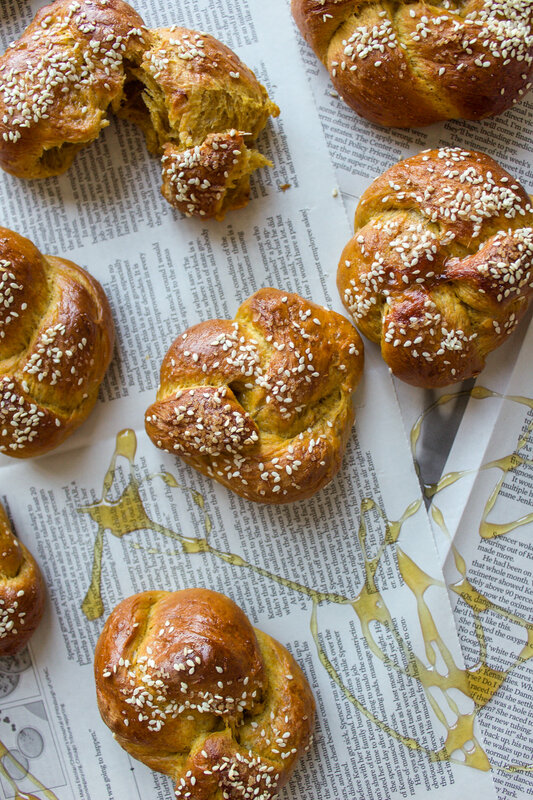 You should definitely check out all the other fantastic pumpkin recipes on her site while you're browsing the interwebs and reading this post. So here they are, a day late but as promised. With a sorta short, not too mentally stimulating post, because I'm truthfully still a little sleepy and tired from work and we're establishing realistic goals over here. They're sweet but not too much so, great with a slather of salty honey butter and an overall satisfying roll for your next autumn gathering. Especially with the holidays so near! I'm so excited. Bring on all the Thanksgiving pies, all the potatoes, all the joyful laughs and smiles. In a small bowl, whisk the warm water, yeast, and 2 teaspoons of brown sugar until foamy. Let sit for 5-10 minutes to activate the yeast. In a bowl of a stand mixer, whisk together the flour, brown sugar, ground cinnamon, ground ginger, ground cloves, ground nutmeg, and kosher salt. In a medium-large bowl, whisk together the egg, vegetable oil, and canned pumpkin. Add this mixture to your stand mixer bowl along with the yeast. Mix until combined with a paddle attachment (just like 3 minutes on medium speed) and then switch out your paddle attachment for a dough hook. Using the dough hook on medium-high speed, knead your dough until it pulls away from the sides of a bowl, about 8-10 minutes. You may need to add a few more tablespoons of flour, but try not to add too much! Transfer the dough to an oil bowl and cover with oiled plastic wrap or a towel, and let rise in a warm place until doubled in size, about 2 hours. On a floured surface, turn out the dough and cut into 16 equal sized pieces. Roll out each piece into a rope, then tie a knot and tuck in the ends. This is a good (albiet shaky) video of how to shape them into pretty rosettes! Place on a baking sheet lined with parchment paper and let rise for 30 minutes. In the meantime, preheat your oven to 375 F.
Once risen a second time, break an egg and whisk it for your egg wash. Using a pastry brush, brush each roll with the egg wash and sprinkle with sesame seeds and some turbinado sugar. Place in the oven and bake for 20-25 minutes until golden brown but cooked all the way through. Remove from the oven and let cool. Enjoy with some salty honey butter for the ultimate carb happy coma.